Just imagine about 60 or 100 years from now, decades after baby murder has been abolished, what do you suppose our future generations will think of these people (in this link) about how they conducted themselves in the midst of the most bloody holocaust the world has ever known? Mind you, the COO of this "pro-life" organization is getting PAID a salary to do this all in the name of "saving 'some' babies." Can you imagine men like, Dietrich Bonhoeffer, putting out a fund raising challenge to his followers, asking them to make a pledge to donate a certain number of Deutsche Marks to his ministry of "Save the Jews" every time the Germans won a gold medal in the 1936 Berlin Olympics? It's time for Christians to stop being so flippant about the barbaric brutality of baby murder that occurs over 3,500 times a day in America. 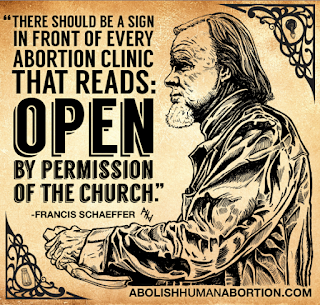 It's time to repent of your apathy and indifference toward the suffering of preborn babies. 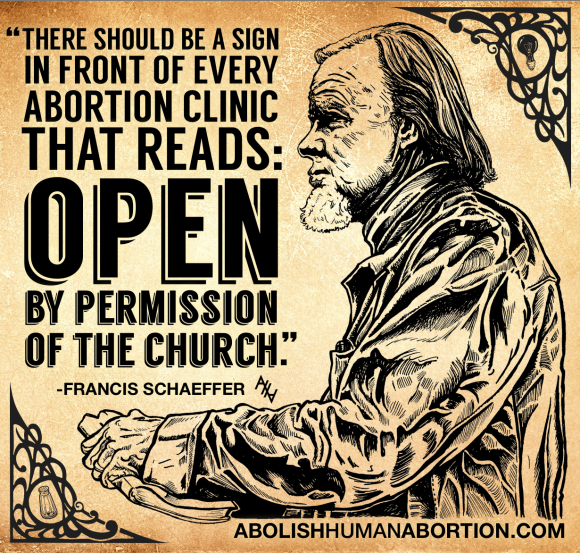 Open your eyes to the horrors of baby murder and get involved in the work to abolish human abortion. Go to www.AbolishHumanAbortion.com and get started TODAY to truly love your preborn neighbors as yourself. If 1% of the people who went to church today would go practice pure and undefiled religion tomorrow, there would be thousands of people gathered outside of every abortion clinic in this country preaching and pleading with those who are there stumbling to the slaughter and taking away innocent children to death. It would be a revival of true and vital Christianity. One of the most biblically ignorant and delusive teachings that a believer can ever fall into thinking is the idea that you can honor and glorify God in some kind of an inactive and inward decision that takes place in your heart or mind alone which is then primarily expressed by meeting, hanging out with, and talking and listening to other people who have also made this decision themselves. It's difficult, one might even say foolish, to argue that giving money, even taxpayer money, to Planned Parenthood is a good thing to do. 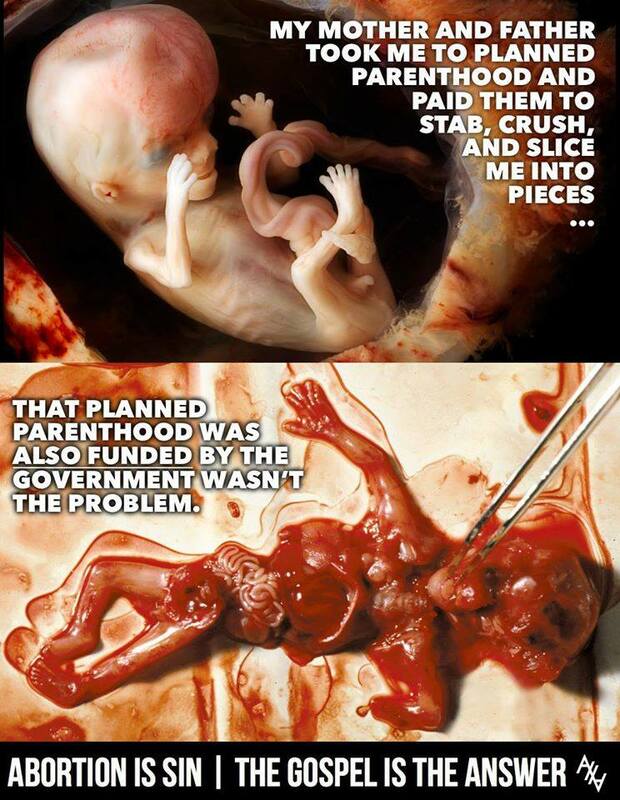 After all, Planned Parenthood is the largest perpetrator of pre-born murder in the United States of America. If we ask ourselves the question "it is better for Planned Parenthood to receive taxpayer money or is it better for them to not receive taxpayer money" the answer should seem quite apparent to all believers. Of course it is better for Planned Parenthood to not be receiving funds of any kind, including that of public funding using Federal Reserve notes collected from taxpayers. So, is it proper to cut off public funding to Planned Parenthood? It seems as though this should warrant a relatively straightforward answer of "yes." As a recent post on this blog so effectively reminded us, cutting off taxpayer funding does not mean that individual taxpayers are guiltless regarding the holocaust of abortion. It is not enough to simply not be financially contributing to murder; one has the obligation to actively work against it. If you know that your neighbors are being murdered, can you pretend that you are guiltless simply because you haven’t financed that murder? If you know it happens and if you fail to attempt to rescue the intended victim, if you fail to raise your voice in their behalf, you have acted to allow an injustice to be perpetrated against your neighbor. As with many other things, our motives for defunding Planned Parenthood are very much a matter of great importance.